Please be prepared for some road closures on your way to WRC’s 8:00 am social run tomorrow morning. 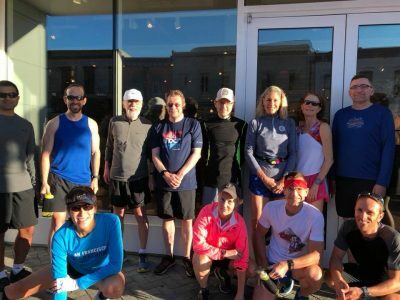 The Marine Corps Marathon will cause some road closures near our CB2 meeting spot, but the group has traditionally met on MCM Sunday, so I expect that if you’re able to make it, there will be some others there as well. It sounds like most of the WRC board will be racing tomorrow or out of town, so don’t wait around for us! WRC also has an opportunity to assist with the Georgetown Half Marathon on October 29. We have been asked to provide the race with a handful of WRC volunteers to staff three water stops on the course from approximately 8:00 am until (at the latest) noon. Our participation would mean a generous contribution to WRC’s financial health. If you are at all interested in helping out (or for more information), email our treasurer, James Scarborough, at jbs1958@comcast.net, and copy me (jordan@washrun.org). We’ll be running on Sunday morning from CB2 at 8:00 am, rain or shine. Come join us for the run, and stick around for coffee at Dean & Deluca. Good luck to any and all who are racing the Portland Marathon, Chicago Marathon, or Army 10-Miler this weekend!